Halloween is such a fun time of the year for kids. (And for grown ups too!) We can get to do fun crafty things for our kids or grand children. 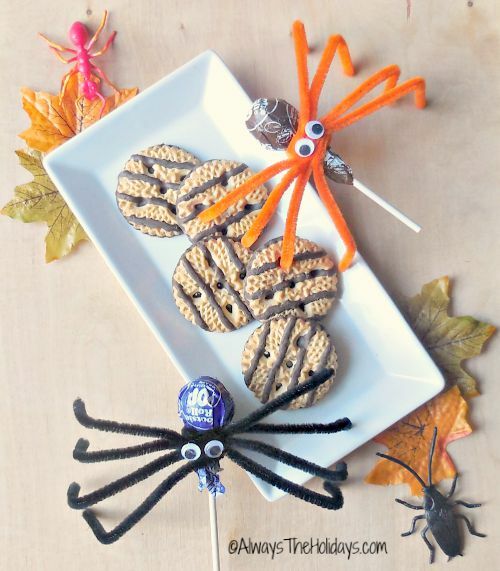 This easy DIY Tootsie Roll Lollipop Halloween spider craft is easy as can be and you probably have anything you need to make them in your craft chest right now. (my favorite kind of project!) Spiders never tasted so good! Using candy in craft projects is fun. The end result is cute and also edible. For another fun tootsie pop craft, check out these Valentine’s day tootsie pop flowers. 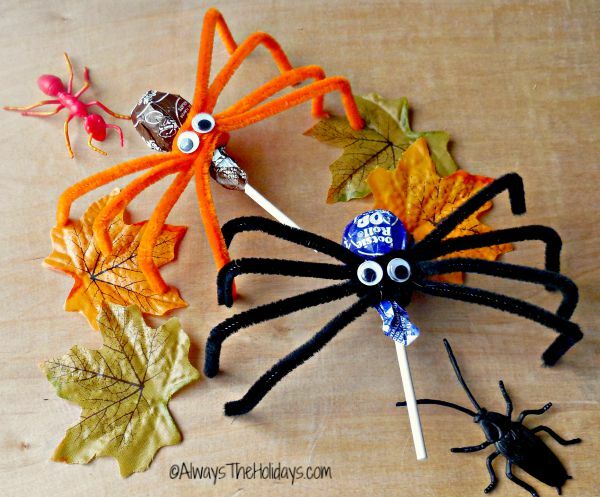 DIY Tootsie Roll Lollipop Halloween Spider. The kids will enjoy making these. All that will be needed for the grown ups is just to oversee a bit and add the hot glue to the eyes at the end of the project. Don’t let the little ones do this part. Ouchie! When they are done, you can place them near a plate of cookies. Which do you think they will want first? The spider or the cookie? I bet I know! For another spider Halloween craft, try making spider ice cubes. The kids will love to help make them, too. This post contains affiliate links for your crafting experience. Here is what you need to make this each spider. These are links to Amazon, but check your Dollar Store first. They also have this sort of supply this time of the year. 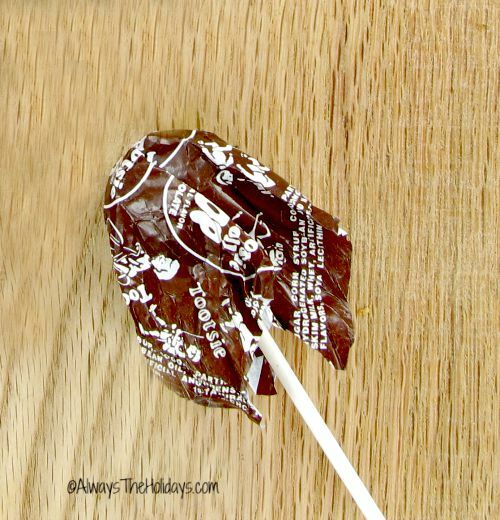 1 Tootsie Roll pop. Your choice of color. 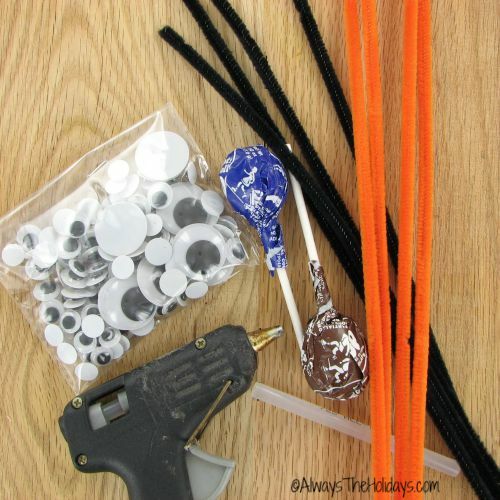 Hot Glue Gun and Hot Glue sticks. Optional: I also got a package of squiggly insects to decorate around the plate and some silk leaves. If you are using the project as a centerpiece idea, this makes a fun platter. Start by opening up the wrapper of the lollipop. This gives a bit of length to the colored part of the body. Take four pipe cleaners and find the center of them. 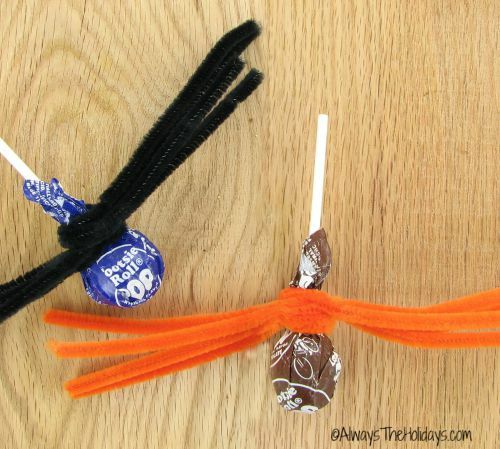 Fold in half and wrap around the base of the lollipop to make a spider head. There is no need to glue them. They will stay in place. Splay out the legs and fold the last inch of them into feet for the spider. Place two dots of hot glue on the head of the spider. That’s it. What could be easier or more fun for the kids? 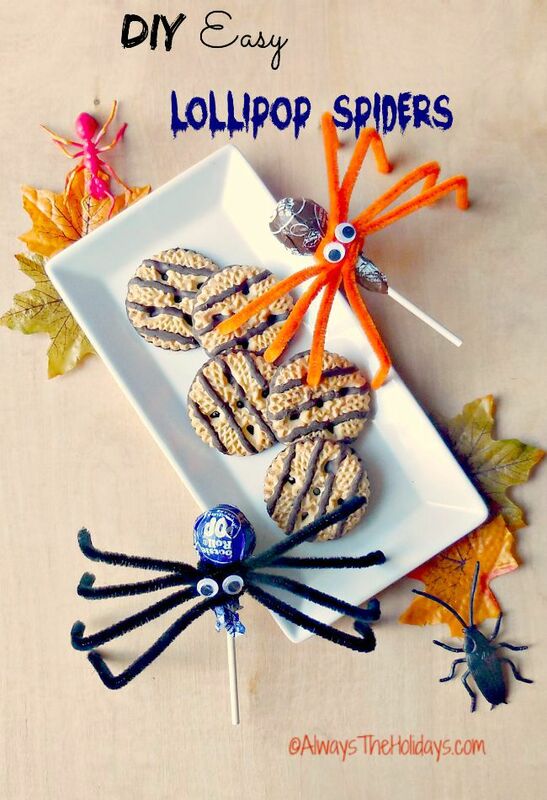 To serve the lollipop Halloween spider, add some cookies to a platter. Arrange your spiders nearby and add the plastic bugs and some silk leaves. Super easy, fun to do and the kids will just love this one! Do you do projects with your children or grand children for Halloween? What do they like best?